We’ve done multiple iterations of dimple designs over the years and put together a sort of in house “bible” on what should and shouldn’t be done. This is a snippet from our bible on when cutting a hole in a panel to dimple die or flare it. Do not place flared holes in panels situated in high stress areas, it will reduce the overall strength of the design. 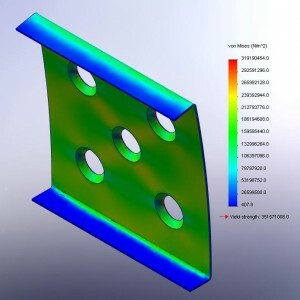 The idea is that if you have a seamless panel (no through holes or flared holes) in a high stress area it will be stronger in most cases due to the lack of stress risers/concentrations. A correctly produced flared hole in most cases will be stronger than a through hole in a panel. If a flared hole must be used in a high stress area the flare should protrude to the side that is bending outwards under load, this will minimize the reduction in strength from the removal of material. This example forces the high stress location to be where the flared holes will be located. It offers a good comparison in terms of flare direction in regards to overall part strength. The strength in this case improved 4.5% by having the flare in the direction of the bending panel. However keep in mind it is still 30% weaker than if the part did not have any flared holes to begin with. Locate the low stress areas, such as web components, and remove weight from those areas by flaring. Removing the mass and flaring the holes in these areas will reduce the weight while providing greater strength. There is a lot less red visible since there are extreme stress concentrations located on the edges of the flared holes. Having the flared holes in this location reduces the part’s effective strength by 20%. Therefore it is a terrible misjudgment to locate flared holes in this high stress region. 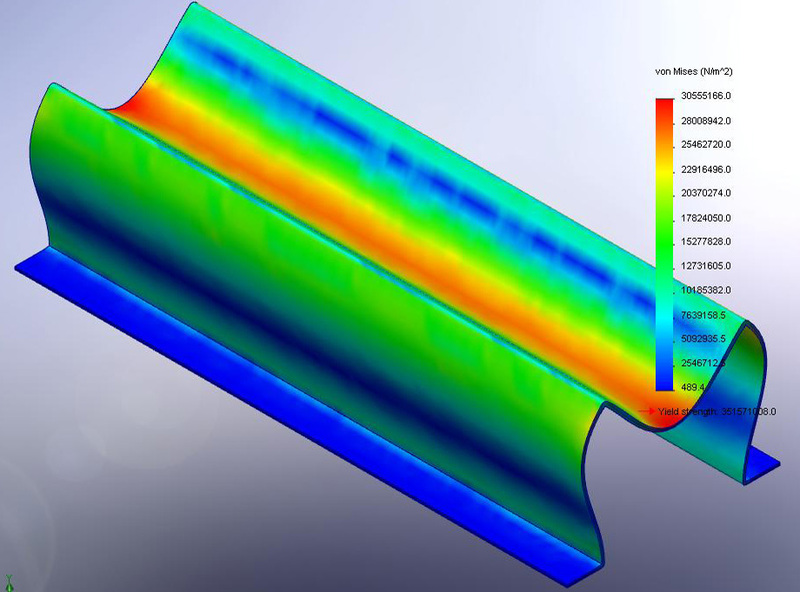 The interesting bit is that the part is 6% stronger than the part without any modifications. 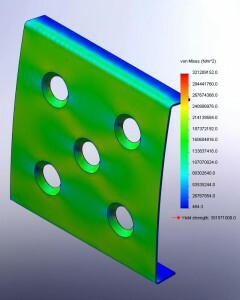 In this case the flared holes improved the strength of the part, while also reducing the weight by 6%. 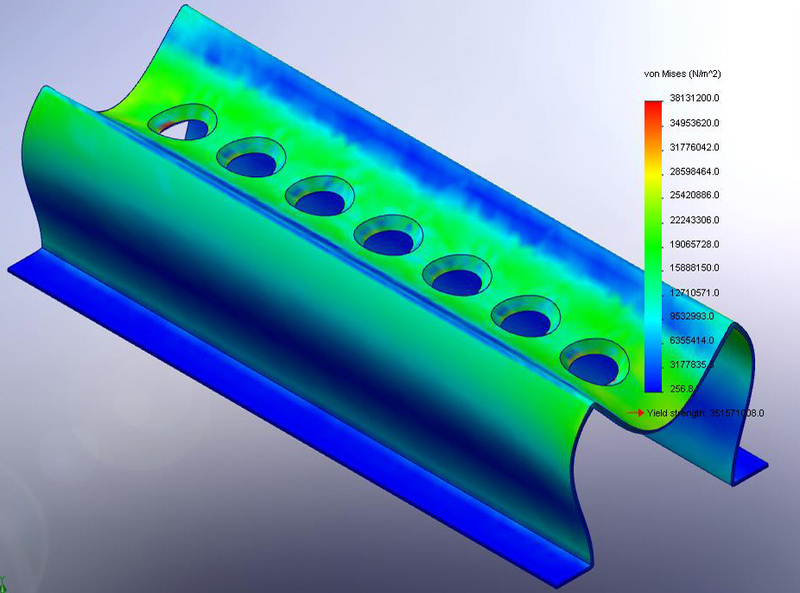 As you can see strategic placement of flared holes can produce a lighter part, as well as a part that can take a greater load. If the flares were inverted in this example (having the flare protrude to the bending side of the panel) the part would be even stronger. Don’t take the exact #’s too literally, just understand that flared holes are only beneficial in low stress areas and can offer greater overall part strength when done effectively. 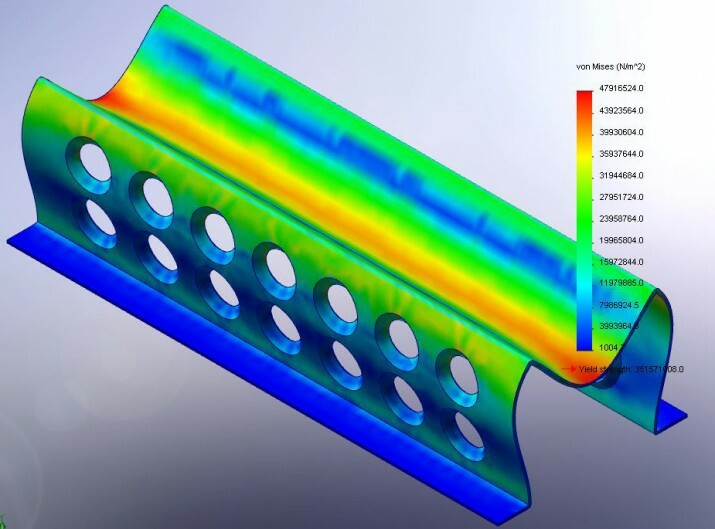 To do it as effective as possible only FEA (finite element analysis) can be performed and the optimal setup can be determined. Otherwise it’s a “best guess” in where and what size flared holes to put in a panel. If you are designing or just building something that you know has an extremely high factor of safety, then having flared holes in conservative locations should only improve the design by removing un-necessary weight. If designing a structure, don’t let the use of flared holes allow for a sloppy/overbuilt design. Please note, this article does not consider the removal of material to be substituted with extra material in the high stress areas. Also this article does not consider panel deflection due to load. Those two are entirely different (but related) topics that are documented in our full “bible”. So rest assured when we punch or cut a hole in a steel part to flare it, we know what we are doing! Please take a look at our dimple die service that we offer.